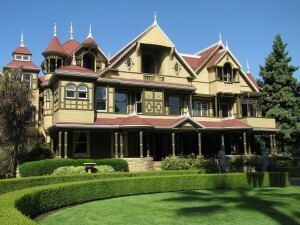 Great deals on Winchester Mystery House tours and hotels. All Winchester Mystery House package reservations must be made directly with the hotels listed below. Hotel Packages do not include 9.5% Occupancy Tax. Please mention the package name when making your reservations. Subject to availability and prices may change without notice. Package is good for Friday and/or Saturday night stays only. Please check with each hotel for weekday availability. One of the most historic buildings in the Bay Area, tour this amazing mansion near Santa Clara, CA. Situated among the modern streets and businesses of San Jose, the exotic gardens and towers of the Winchester Mystery House make for a surprising and fascinating daytrip. Make the most of your excursion by reserving our Winchester Mystery House Hotel Package. The package features deluxe accommodations, two adult tickets to Winchester Mystery House, and a complimentary continental breakfast. For more information about the Winchester Mystery House Package or to book now, please contact the hotel directly at (408) 244-3366 or select the contact us button and a member of our friendly staff will contact you. Winchester Mystery House™ is an extravagant maze of Victorian craftsmanship – marvelous, baffling, and eerily eccentric, to say the least. Tour guides must warn people not to stray from the group or they could be lost for hours! Countless questions come to mind as you wander through the mansion – such as, what was Mrs. Winchester thinking when she had a staircase built that descends seven steps and then rises eleven? Your package includes: One night accommodation in Garden or Tower suite, two adult tickets to the Winchester Mystery House, Buffet Breakfast for two at Montague’s Café, and transportation to and from. Package available Friday, Saturday, and Sunday nights based on availability and excluding Black Out dates. Please ask Reservations about Black Out dates and times. Winchester Mystery House Package start at just $165 – $175 per night. Additional adult admission tickets available at $30.00 each.